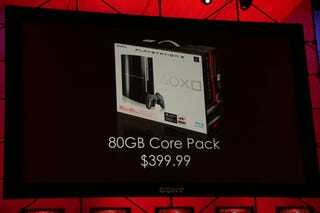 At Sony's E3 2008 press conference, Jack Tretton announced a 80 GB PS3 "Core Pack" that'll go for $400 — "the same functionality of the 40 GB... with twice the storage," he said. LOS ANGELES, July 15 /PRNewswire/ — Sony Computer Entertainment America (SCEA) held its annual press conference today at the E3 Media & Business Summit, making a series of announcements which demonstrated the strength of the PlayStation brand across all three of its platforms and further leveraged the heritage and momentum of PlayStation's family of products to provide consumers with more compelling entertainment options than anyone in the videogame industry. Starting in September 2008, the newly announced PLAYSTATION(R)3 (PS3(TM)) 80GB model will become the mainstay of the company's hardware line-up. The 80GB model will retail for $399, and will offer all of the features and functionality of the 40GB model with double the storage to accommodate more movies, graphics, music, photos and other entertainment content — all for the same price. As with its predecessor, the new 80GB model will be a complete entertainment system comprising of a Blu-ray(TM) player, HDMI output, an integrated Wi-Fi connection, Cell Broadband Engine(TM) and a built-in 80GB hard-disk drive. The multi-functionality of the 80GB PS3, combined with more than 140 exclusive and third-party titles and the PLAYSTATION(R)Network, is a comprehensive entertainment value designed to appeal to a wide range of consumers from hard-core gamers to general entertainment enthusiasts. Following the success of five PSP(R) (PlayStation(R)Portable) Entertainment Packs, SCEA announced the Ratchet and Clank(R) Size Matters PSP Entertainment Pack, a new bundle showcasing PSP's multi-functional feature set, targeted for holiday gift-giving. Launching in October 2008 for $199.99 MSRP, the bundle will include a limited-edition "Silver" PSP system with the highly acclaimed game, Ratchet and Clank(R) Size Matters; a blockbuster movie on UMD(R) (Universal Media Disc); a PLAYSTATION(R)Network voucher to download the innovative puzzle game, echochrome(TM) from PLAYSTATION(R)Store: and a 1GB Memory Stick PRO Duo(TM) for storing music, videos, photos and more. In addition, SCEA introduced a new family entertainment bundle for the PlayStation(R)2 system, the most successful console in industry history. The limited-edition LEGO(R) Batman(TM): The Videogame PlayStation(R)2 Pack will feature the highly anticipated TT Games/Warner Bros Interactive Entertainment title LEGO(R) Batman(TM): The Videogame, Warner Home Video's Justice League: The New Frontier on DVD, and a PlayStation(R)2 system — all for $149.99 MSRP, which represents a $30 savings for consumers if the contents were purchased separately. SCEA will also launch more than 130 new titles for PlayStation(R)2 system this year, totaling 10,000 PlayStation(R)2 titles by end of the year. "It's undeniable we have three successful platforms, the broadest and best line-up of some of the biggest exclusives in the business, and are continuing to deliver compelling and original content to our consumers," said Jack Tretton, president and CEO of Sony Computer Entertainment America. "Expect to see continued momentum this year as we remain focused on delivering products and services that extend the strength of our brand and reaffirms PlayStation's place at the center of consumers' homes." Additionally, the company previewed more than 140 first and third-party games at E3 2008 proving its content line-up this year is unmatched in the industry due to its depth, breadth, and diversity. Throughout the holiday season and this fiscal year, SCEA and its third-party partners plan to release more than 140 software titles for the PS3 available on Blu-ray Disc(TM) (BD). SCEA is also developing more than 50 games, game packs, and add-ons downloadable via PLAYSTATION(R)Network in North America this year, offering something for every taste, lifestyle and budget. Also, to continue offering greater value to PlayStation fans, SCEA will launch PS3 Greatest Hits program on July 28 with 10 first and third party titles at a reduced price of $29.99. The PS3 Greatest Hits titles include Warhawk(TM), Motorstorm(TM) and Resistance: Fall of Man(R) from SCEA; Call of Duty(R) 3, Activision(R); Need for Speed: Carbon, Electronic Arts; The Elder Scrolls(R) IV: Oblivion(TM), Bethesda(R) Softworks; Ninja Gaiden(R) Sigma, Tecmo(R); Tom Clancy's Rainbow Six(R) Vegas and Assassin's Creed(TM), Ubisoft(R). SCEA also reiterated its commitment to make PLAYSTATION(R)Network the best entertainment experience in the industry, by announcing a new video delivery service on PLAYSTATION(R)Store for PS3 and PSP systems in the United States. The new video service, available today, allows U.S. consumers to download full-length TV shows and movies to both their PS3 and PSP through the PlayStation Store for rental or purchase. In addition, SCEA further outlined progress against its revolutionary online experience, PlayStation Home. Highlighting new first party high definition virtual environments for hit PlayStation titles including, Unchartered: Drake's Fortune and Warhawk. With significant third party support already on board, Sony Computer Entertainment will be expanding the beta in Summer 2008 and commence the open beta service by Fall 2008.